Steve Lafler studied painting and studio art at the University of Massachusetts. While there, he had a daily comic strip in the student newspaper. That is how he got his start. “I don’t know why I am so hooked on jazz,” says Lafler, the 55 year-old cartoonist and graphic novelist, as he asks for an impromptu explanation of the modes and the pentatonic scale. 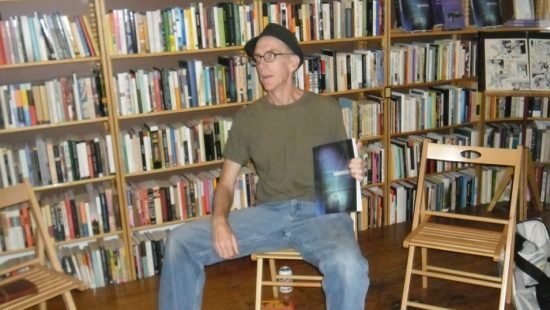 Lafler is hanging out at Ada Books in downtown Providence, Rhode Island. He is currently on tour to promote his latest project: Ménage à Bughouse. The material in Ménage à Bughouse is not new. In fact, the project began in 1993 and was finished in 2004. The three sections of the book that Steve Lafler is promoting now were originally released as three graphic novels on Top Shelf, published in 2000, 2002 and 2005, respectively. On Top Shelf, Bughouse sold more than 10,000 books. Recently, Lafler was approached by a publisher from CO2 comics who had the idea of publishing all three together as one wonderful Bughouse trifecta. “…About six months prior, I’d read the shocking and lively autobiography of Miles Davis, the jazz trumpet giant of the 20th century. Miles was a supreme raconteur, spinning his narrative around the creative leaps of Charlie Parker, Dizzy Gillespie and many others as well as himself. He was the brilliant bad boy at the center of cutting-edge jazz, getting into hair-raising scrapes as a matter of course. He writes that Bughouse was born from his “fascination with the post-war NYC world that served as a backdrop to the Be-Bop and Beat movements…” He adds: “I was pregnant with intent to create a story set in that milleau. “The intent gathered strength and spilled over into the physical world. I quickly sketched a tight little drawing of an insect saxophone player in a pin-stripe suit. I inked the drawing and had my first image of Jimmy Watts-the strutting saxophone genius, capable of explosive innovations at the drop of a hat, yet crippled by addiction to a substance known as Bug Juice. Today, Steve Lafler resides in Oaxaca, Mexico. You can contact him or see more of his work by visiting his site.